Lambda architectures enable efficient data processing of massive data sets. Lambda architectures use batch-processing, stream-processing, and a serving layer to minimize the latency involved in querying big data. This article describes the fundamentals of a lambda architecture based on the original multi-layer design and the benefits of a "rearchitected" lambda architecture that simplifies operations. A lambda architecture is a generic, scalable, and fault-tolerant data processing architecture to address batch and speed latency scenarios as described by Nathan Marz. The basic principles of a lambda architecture are described in the preceding diagram as per http://lambda-architecture.net. From an operations perspective, maintaining two streams of data while ensuring the correct state of the data can be a complicated endeavor. To simplify operations, utilize the Azure Cosmos DB change feed support to keep the state for the batch layer while revealing the Azure Cosmos DB change log via the Change Feed API for your speed layer. To run a quick prototype of the Azure Cosmos DB change feed as part of the speed layer, can test it out using Twitter data as part of the Stream Processing Changes using Azure Cosmos DB Change Feed and Apache Spark example. To jump-start your Twitter output, see the code sample in Stream feed from Twitter to Cosmos DB. With the preceding example, you're loading Twitter data into Azure Cosmos DB and you can then set up your HDInsight (Apache Spark) cluster to connect to the change feed. 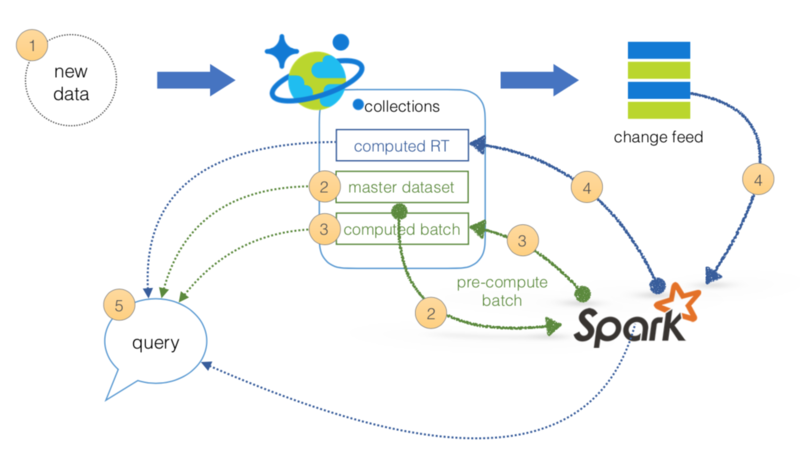 For more information on how to set up this configuration, see Apache Spark to Azure Cosmos DB Connector Setup. The following code snippet shows how to configure spark-shell to run a structured streaming job to connect to an Azure Cosmos DB change feed, which reviews the real-time Twitter data stream, to perform a running interval count. The output of this is a spark-shell console, which continuously runs a structured streaming job that performs an interval count against the Twitter data from the Azure Cosmos DB change feed. The following image shows the output of the stream job and the interval counts. All queries can be answered by merging results from the batch views and real-time views, or pinging them individually. To showcase how to execute pre-calculated views against your master dataset from Apache Spark to Azure Cosmos DB, use the following code snippets from the notebooks Lambda Architecture Rearchitected - Batch Layer and Lambda Architecture Rearchitected - Batch to Serving Layer. In this scenario, use the Twitter data stored in Azure Cosmos DB. Let's start by creating the configuration connection to the Twitter data within Azure Cosmos DB using the PySpark code below. "query_custom" : "[Cosmos DB SQL Query]"
Next, let's run the following Spark SQL statement to determine the top 10 hashtags of the set of tweets. For this Spark SQL query, we're running this in a Jupyter notebook without the output bar chart directly following this code snippet. Now that you have your query, let's save it back to a collection by using the Spark Connector to save the output data into a different collection. In this example, use Scala to showcase the connection. Similar to the previous example, create the configuration connection to save the Apache Spark DataFrame to a different Azure Cosmos DB collection. After specifying the SaveMode (indicating whether to Overwrite or Append documents), create a tweets_bytags DataFrame similar to the Spark SQL query in the previous example. With the tweets_bytags DataFrame created, you can save it using the write method using the previously specified writeConfig. This last statement now has saved your Spark DataFrame into a new Azure Cosmos DB collection; from a lambda architecture perspective, this is your batch view within the serving layer. val sourceCollectionName = "[SOURCE COLLECTION NAME]"
val sinkCollectionName = "[SINK COLLECTION NAME]"
With this design, you only need two managed services, Azure Cosmos DB and HDInsight. Together, they address the batch, serving, and speed layers of the lambda architecture. This simplifies not only the operations but also the data flow. New data: The stream feed from Twitter to CosmosDB, which is the mechanism to push new data into Azure Cosmos DB. Batch layer: The batch layer is composed of the master dataset (an immutable, append-only set of raw data) and the ability to pre-compute batch views of the data that are pushed into the serving layer. 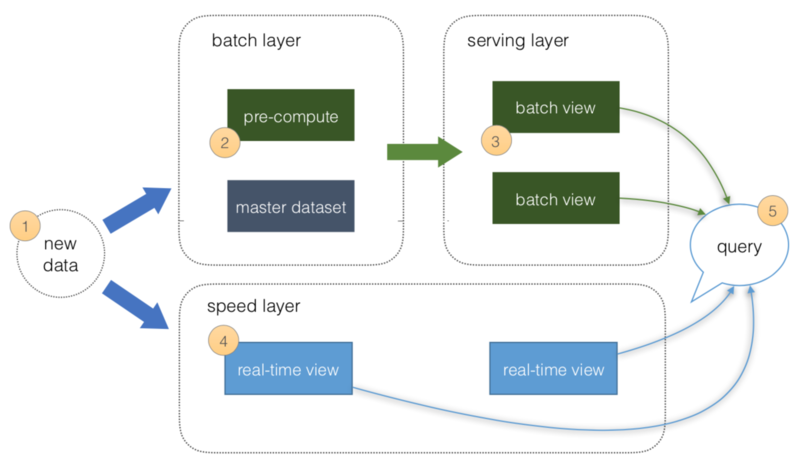 The Lambda Architecture Rearchitected - Batch Layer notebook ipynb | html queries the master dataset set of batch views. Serving layer: The serving layer is composed of pre-computed data resulting in batch views (for example aggregations, specific slicers, etc.) for fast queries. 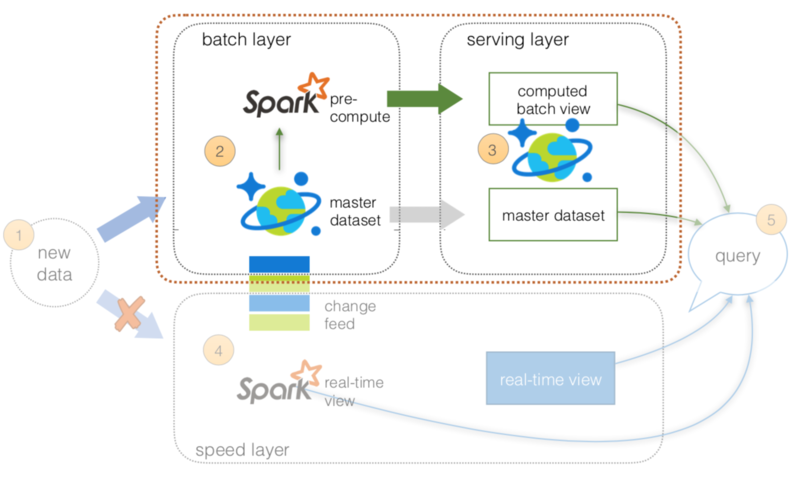 The Lambda Architecture Rearchitected - Batch to Serving Layer notebook ipynb | html pushes the batch data to the serving layer; that is, Spark queries a batch collection of tweets, processes it, and stores it into another collection (a computed batch). 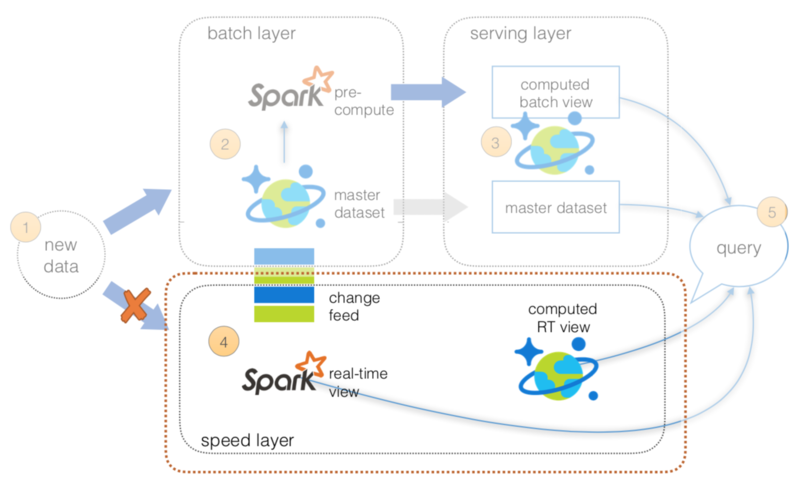 Speed layer: The speed layer is composed of Spark utilizing the Azure Cosmos DB change feed to read and act on immediately. The data can also be saved to computed RT so that other systems can query the processed real-time data as opposed to running a real-time query themselves. 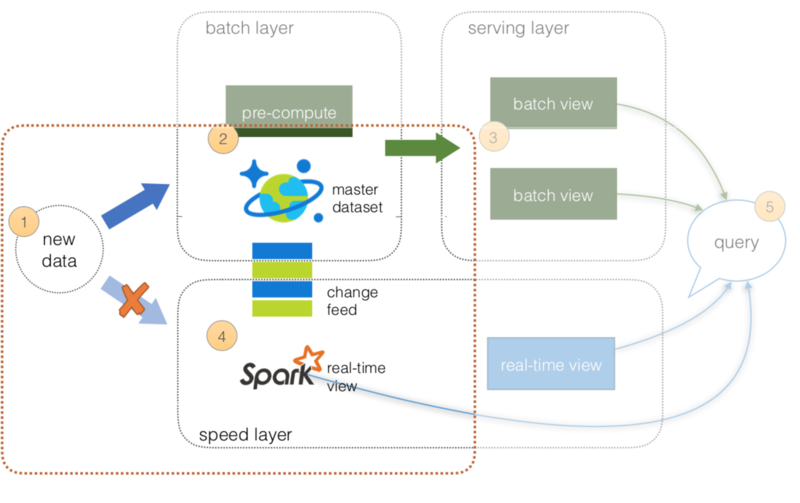 The Streaming Query from Cosmos DB Change Feed scala script executes a streaming query from the Azure Cosmos DB change feed to compute an interval count from the spark-shell. 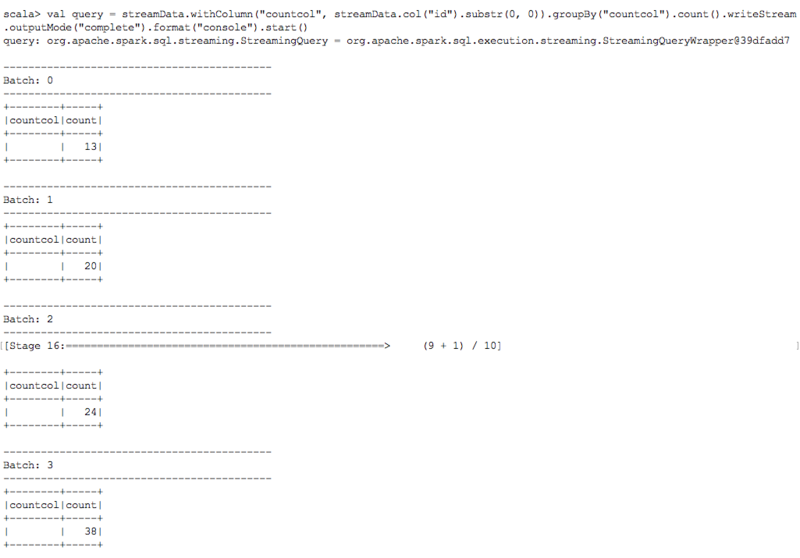 The Streaming Tags Query from Cosmos DB Change Feed scala script executes a streaming query from the Azure Cosmos DB change feed to compute an interval count of tags from the spark-shell. You might also want to review the Apache Spark SQL, DataFrames, and Datasets Guide and the Apache Spark on Azure HDInsight article.